Liven up your lighting with our personalized coolie lamp shade. The Coolie shade style has a wide base resulting in most of its light being widely emitted from the bottom. Perfect for reading, this lamp can be the focal point of a smaller room or an accent piece for a larger room. With a base measurement of 11" in diameter, this lamp goes well in a reading nook or on a bedside table in your bedroom. The angled shade is made of lightly textured fabric that is easily dusted with a soft cloth. The top and bottom are lined with a white fabric ribbon to give the lamp shade a finished look. Being a slip UNO fitter lamp shade, it will be easy to find a base to match! If you were looking for a slightly smaller lamp shade, be sure to check out our Empire lamp shade! 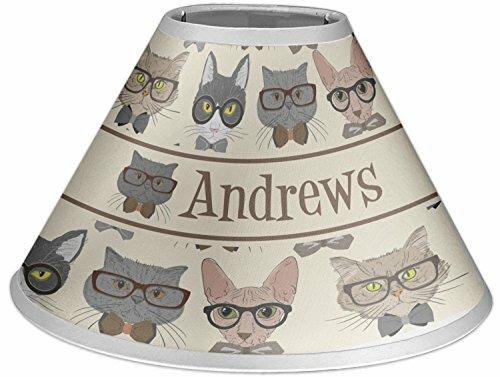 Now just personalize your lamp shade! Use a fun pattern that shows your personality or find something to match your decor! Easily put your name or a monogram on the lamp shade to really make it yours. There are hundreds of patterns and graphics to choose from, so have fun exploring! If you ever need help in the design center, please don't hesitate to use our online chat or phone number to get in contact with a LIVE customer service agent. Happy designing!